Coding is fun, debugging issues on other team members machines isn't. It works on my machine doesn't cut it anymore! This post outlines how to run your code in a container rather than directly on your machine including how to debug and run tests, why you should do it and what the trade offs are. It's a bit of a joke between old school developers from the days where sharing code involved passing physical media between each other. But even today with all the fancy CI/CD it costs serious money and causes massive frustration. If you have ever worked on a team where you rely on code created by a team member, there is at least one time during the project that you just can't get it to work. You call the person who developed it across, try everything you can think of, delete everything, reinstall, do it again, then you both sit with blank expressions staring at the screen slowly loosing the will to live. How do containers solve this problem? Like most software solutions this problem was modeled against one that was solved decades ago in the 1950's. Before the 50's most cargo ships were transporting entire lorries including the trailer and the cab. Then Malcolm McLean came along. He owned a lorry company and saw what a massive waste of space this system of transporting the whole vehicle, so he made detachable containers that fit both on the trailers of the lorries and in a specially designed cargo ship and container ships as we know it were born. If we translate this back to software, containers are self contained processes on your machine that share some of your underlying OS and add some additional functionality. All the isolation of a VM without the duplication of an operating system. This isn't a new concept and can be traced back to Unix V6 but it took until 2013 for containers to become easy for the likes of us mortals to use. So, back to using the things. Why you would want to do this. Versions of any runtimes (e.g. node) are synchronized across the team. Code can use built-in optimized OS specific functionality like find or grep without having to build in a shim for different operating systems. It is easier to deploy to production later either using a container orchestration systems or use the image definition to build up the bare metal. All local settings are now in code, environment variables, arguments, port numbers etc. Requires staff to have additional skills / knowledge of linux / chosen OS (could be also a benefit to upskill?). To achieve this nirvana we will be using docker. You can download this for Mac, Windows or Linux. Just have a look at the site. We will also be using nodejs and vscode, and git to get the source code You can use any language, OS, editor or ide you feel comfortable with, but I feel comfortable with linux, node and vscode. The best way to learn this stuff is just to get stuck in and try an break things. I've created a repo with a simple static page that is returned. You can expand to whatever the new hotness is. Open a new terminal, this will display the logs of the running node process. Navigate to http://localhost:3000 to see your new beautiful site. Open vscode with the command line tools. You should be automatically focused on that line in vscode. You are now debugging! Change the code and refresh http://localhost:3000 to see your changes. You can do that too! 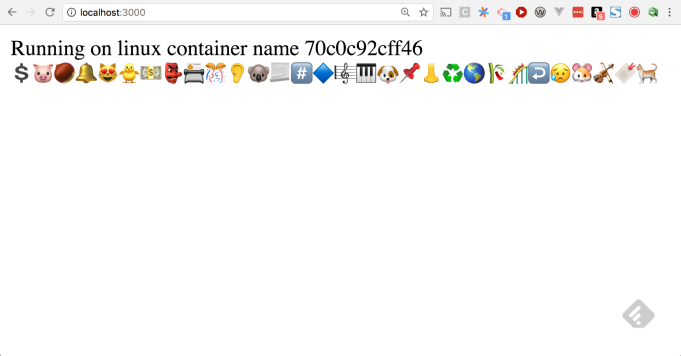 Open a new terminal and run the tests inside the container. I hope this gives you an idea of the pros and cons of using Docker for your development environment. It's a bit of pain upfront but is worth it in the end.